You are here: Home / BLOG / Uncategorized / MORE Kittens!! We had a cat deliver kittens under our back deck. We have placed all but one… little Tiger. This is Tiger. Tiger is about 9-10 weeks old, litter trained, flea-treated, and wormed. He’s been handled daily since about 5 weeks, and he’s lived inside with us for the past three weeks. He’s energetic and has a good disposition. He’s ready to be somebody’s kitty. He’s a really precious cat, but we have 3 (we’re keeping one kitten, and already have two other rescue cats) plus three dogs. Our house is FULL. We are also helping to place another litter which Momma Kitty’s adult daughter, whom we call Pretty Kitty, had across the street. The folks there have been feeding and handling these kittens for almost 5 weeks. 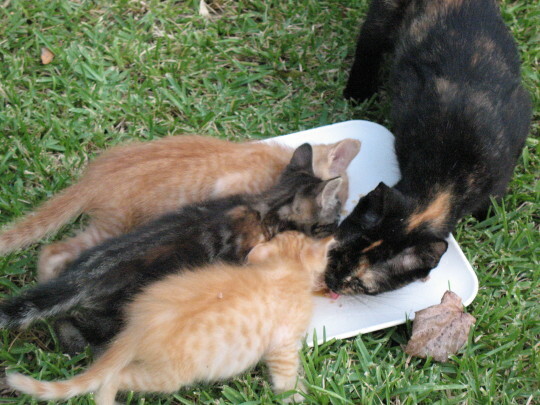 Since we took away Momma Kitty’s kittens, she’s been helping to raise and feed her daughter’s litter, and she brings them over to our house for additional food. These are all boys. They’re a little younger than our litter; they’re probably 8 weeks now, eating solid food all the time and so far as we can tell no longer nursing. They haven’t gone to the vet, but appear in good health. 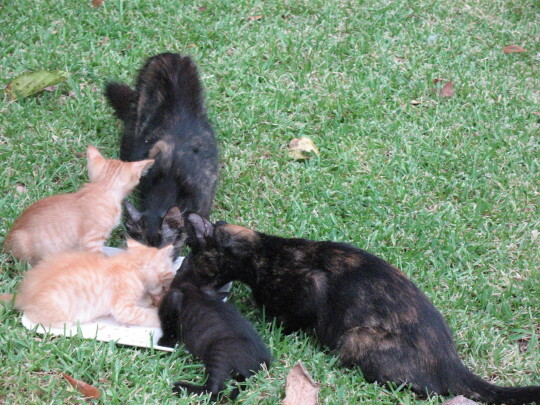 We flea-treated Momma Kitty (who is the grandmother of these kittens), and it seems like it’s cut down on their fleas – they do have a few, but not many. Yes, we are working with KittiCo to get Momma Kitty and Pretty Kitty spayed, and we’ll neuter our kitten when it’s old enough. Buttercream is orange and yellow, and very soft. He’s probably the sweetest of these kittens, although not always the bravest. He cleans my fingers when I hold him, although it may be that I get catfood on them feeding everybody. 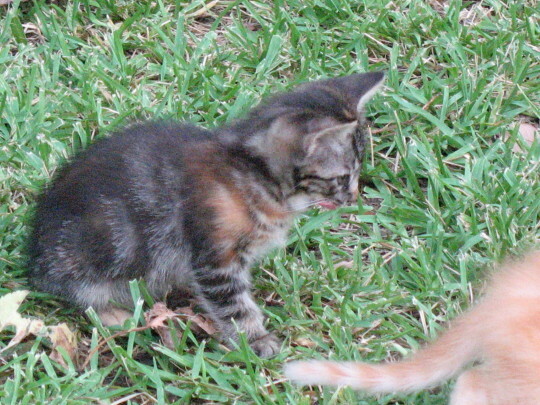 This kitten is mostly brown-tabby, with little patches of orange tabby. It looks like there are little bits of sunlight on him. So I call him JohnDenver. Sunshine on his shoulders, makes me happy. 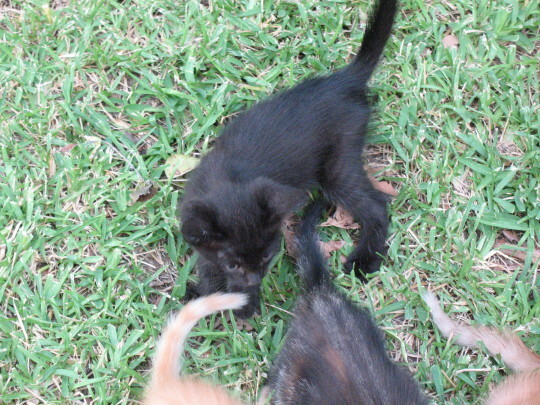 This little kitten is all black, except for some long white hairs on his legs. We call him Sspookeh. … because this is what happens when the flash catches him. He’s prety shy. 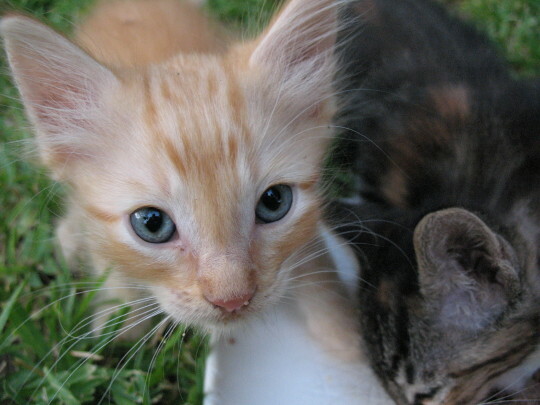 The fourth kitten – a lean and lanky red tabby. I couldn’t get any good shots of his face, but he has a marking on his eyebrow area that makes him look worried. 0 0 Michael Michael2007-09-07 09:50:002007-09-07 09:50:00MORE Kittens!! Too cute! Good luck on the placing of them. And happy birthday! Oh how I iwsh I could join in the kittenish fun…. Thanks! I wish you could have one, too – I certainly can’t keep them all! i have a post for you a little later. ps, pls fedex kitten stat. LOL. I am picturing some LOLCats thing with FedEx Kitten. i can haz duty free? I’m glad KittiCo is helping you help the cats! They are a great group. Awwwww. You must love all of the cuteness running around. 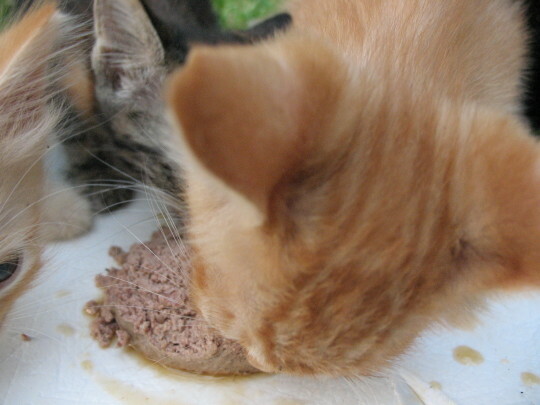 Yeah, it’s been nice, being able to have “kitten time” – but, also crazy with “kitten underfoot” and “myowling cat at door wanting food.” I’ll be glad once the kittens are gone, and we’re back to the 2 big cats, 1 new kitten, and probably 2 yard cats. I have four indoor cats and no kittens. We seem to either have them in pairs or in clusters when we get new kittens/cats. The advantage of clusters is being overwhelmed enough to want to get rid of them. Pairs are too easy to accomodate. We rescued a pregnant Flame Point Himalayan in 1993… she had 3 kittens, we kept 1, Magellan. 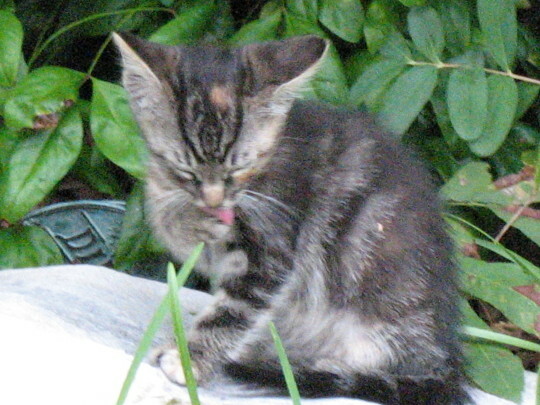 We rescued a litter of feral kittens and the momma in 2002, we kept one kitten, Greysie. So I figured it was a good idea to keep one of these (Bob, not pictured, except for in the very first photos of the kittens… because I didn’t want anybody to beg!) I can’t keep one from both litters, or we’ll be tripping over them. So far, Bob is bossing around the dogs and stealing their treats. One of the dogs tries to carry him, and seems sure that he’ll squeak if chewed just right. Good luck with placing the last one. I don’t think my two cats would be pleased if I added another. Happy Birthday to you also! Hope the year ahead is fantastic! Our cat Shan is either going to be a dog in the next life or was one in the last. He greets people at the door, insists on escorting and examining people and their belongings, etc. He also convinced our two mastiffs that he is the biggest dog. He drinks from the dog water, eats from the dog bowls, and sleeps on the dog bed once in a while. I want one, but I can’t have any right now :(. Stupid dorm rules. And hope you find homes for all them…they are beautiful so I bet it won’t be a problem. You’re killing me with the cutesness of these kitties. If it were up to me I’d probably have 10 cats. I know one day I will be the crazy old lady in the neighborhood with hundreds of cats. yeah, I could totally go crazy-cat-lady. Happy Birthday! I wish you lived closer than 2 states away, I would take that handsome little man! Oooooh, I love kitties, but my nose does not. Good luck placing them, and happy birthday! Yeah, wish you could! He’s such a nice kitten, but we’ve got our hands FULL! oooooooh… I love little kitty belly. soooo cute. wow! SO much love there! Hey you! my item says that it’s your birthday. HAPPY BIRTHDAY you big animal lovin sweetie you! Thank you for taking care of the kittens and finding good homes for them. Kitty Krack… That should be the name for all cute pictures of kittens. You just can’t get enough of the fuzzy love. I would so take that brown & orange one off your hands if I lived anywhere near you. If you weren’t so far away, I could take the kitty. I’, looking for a new pet. Oh dear. Well, you can crank up the kitten-cluckiness meter another notch! What a beautiful bunch. I hope you are successful in finding homes for them all! Tiger and Buttercream are especially gorgeous. Buttercream found a home yesterday; I’m still holding out hope for Tiger. and thanks! I had a pretty fantastic birthday; my husband is exceptionally sweet and made it a lot of fun for me. Ohhhhh, babykitties!!! I _SO_ wish I could take one (I think I’m even really close, geographically), but we recently adopted a kit who is keeping us VERY busy. 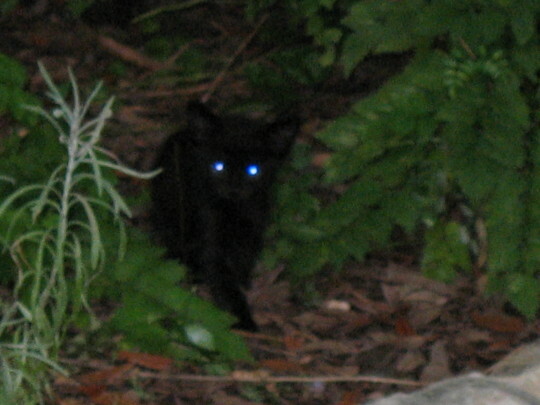 We had a feral cat give birth to a litter under our back deck last year; unfortunately they never were tame-able. And mama-cat moved them before we could trap them and get them to Operation Kindness. 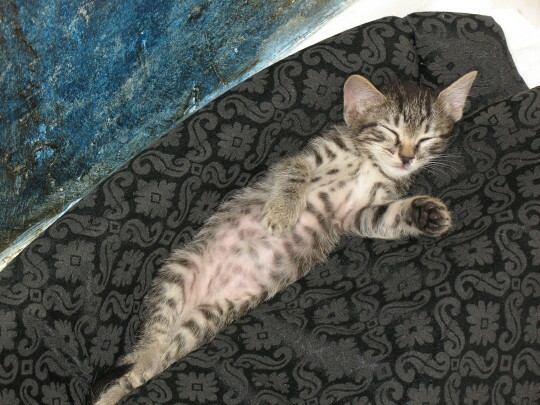 I’ve been involved in rescuing cats, and taming the kittens (that origianlly came in belly) as well. Once, I had 13 cats and kittens to take care of! They went off to the Cat Protection Society, which is excellent. They don’t toss the kittens out to whoever asks – they interview to make sure that they will be suitable owners.